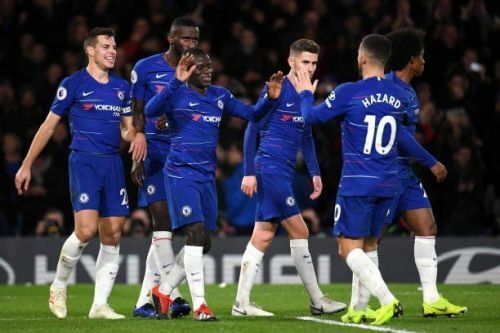 Current defending champions and leaders of the title race up until Liverpool's game against Bournemouth yesterday, Manchester City, lost out on a golden opportunity to reclaim the table's top spot as Chelsea handed the visitors a stunning 2-0 defeat at Stamford Bridge. The Manchester-based outfit enjoyed much of the ball-possession in the first half, but failed to convert it into scoring shots. On the other hand, French midfielder N'Golo Kante launched a fine shot into the top corner of City's goalpost just before half-time to give the hosts a big advantage and a lead. In the second half, the visitors suffered further setbacks as David Silva and Leroy Sane retired to the bench with injuries, and with a goalscorer like Sergio Aguero already unavailable, they started falling behind. Late in the game, Chelsea defender David Luiz nodded a corner kick past City goalkeeper Ederson to double the lead and virtually seal the game for the hosts. Let us examine some key talking points from the contest. The team sheets of neither side featured a centre forward, with the likes of Alvaro Morata, Olivier Giroud (both of Chelsea), and Gabriel Jesus (of Manchester City) starting the game on the bench. 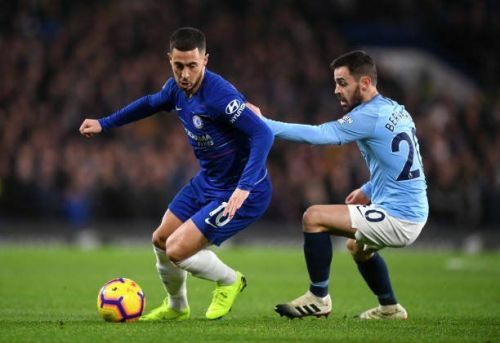 Chelsea boss Maurizio Sarri sent a clear message to under-fire Morata and Giroud by opting to go with Eden Hazard as a false-nine, alongside Pedro and Willian turning up on either side of him. In the pre-match talk, Sarri hoped that his new method would bring in positive changes now that his team had more space to operate. In the case of Manchester City, their most important scorer, Sergio Aguero, has been recovering from injury, so was unavailable, and manager Pep Guardiola decided to overlook his deputy striker Gabriel Jesus due to a recent lack of form. Jesus hasn't scored in the competition since the month of August. So England international Raheem Sterling was given the role of finishing, with Riyad Mahrez and Leroy Sane operating on either flanks. It was clear Pep opted for such a selection for City's front-three due to their pace.